On the 8th March 2018 at the Economist World Ocean Summit, The Nature Conservancy and the State Government of Quintana Roo, Mexico, announced the creation of the ‘Coastal Zone Management Trust’ (CZMT) covering 60km of the Mesoamerican Reef around the Yucatan Peninsular. 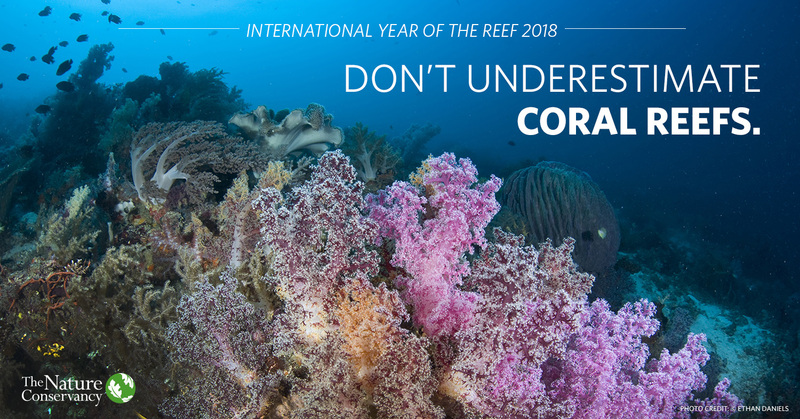 Coral reefs are incredibly valuable – a healthy reef system can reduce a wave’s energy by up to 97% before it hits the shore. This means that a loss of just one-meter reef height from a powerful storm could result in a twofold increase in the cost of damage to vulnerable coastal communities. Reefs are essential for coastal protection, and are a powerful natural climate solution. However, data show that since 1980, 80% of live coral cover in the Mexican Caribbean has been lost or degraded due to disease, bleaching events, diminishing herbivores, and algae overgrowth. The CZMT will finance ongoing maintenance of reefs and beaches and purchase insurance to ensure these vital ecosystems are restored after extreme storms hit. The trust will receive taxes, collected by the tourism industry, that can be used to fund maintenance and restoration efforts for 60 kilometers of reef and beaches in the Cancun and Puerto Morelos areas. In addition to funding ongoing conservation work, the trust will also be used to purchase an insurance policy. The insurance is triggered when severe weather hits the area of reef, as reefs can be damaged in when wind speeds exceed approximately 100knots. The released funds can then be used for restoration activities to help the reef recover—and those return to its full protective capacity—more quickly. This innovative funding system will help to protect a $10 billion tourism industry; bolster economic resilience of the region; encourage conservation of a valuable natural asset; and create a scalable new market for the insurance industry—a model which could be applied to other regions and ecosystems. The launch of the Coastal Zone Management Trust is fantastic progress towards making the International Year of the Reef 2018 a huge success and securing sustainable and impactful protection of the world’s coral reefs.